Hashimoto’s thyroiditis can lead to an under active thyroid (hypothyroidism). 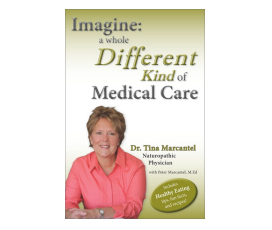 In this video from a series on her book, Imagine: A Whole Different Kind of Medical Care, Dr. Tina Marcantel discusses the identification and treatment of the disease. Dr Tina Marcantel is a naturopathic physician in Gilbert, Arizona, who also serves the East Valley cities of Mesa, Tempe, Scottsdale, Chandler, Queen Creek, Apache Junction, Gold Canyon, and the greater Phoenix area. Hashimoto’s thyroiditis is a condition in which the person has hypothyroidism, but they also have an autoimmune disease in which their antibodies attack the thyroid gland. There’s a lot of inflammation that happens in the area of the thyroid gland, but inflammation can also occur in different parts of the body causing aches and pains of the joints and the muscles, and such as that. How do we treat Hashimoto’s thyroiditis? Of course, we’re going to give medication according to the patient’s symptomology and blood test reports. Another thing is that the patient will have to stay away from gluten as much as possible, and reduce the amount of stress in their life. Stress is a big problem with Hashimoto’s patients because it does affect their antibodies. So, when the stress goes up, the antibodies levels go up, and thus the symptomology also increases, as well. I know in your chapter on hypothyroidism in your book you give the example of a schoolteacher who’s your patient whose stress at the beginning of the year exacerbates her Hashimoto’s. Can you talk about that a little bit more? Stress is different for everybody because stress for one person may not be stress for another person. So it’s not only the job, or the kids, or volunteering for too many things that can cause stress, but also when your body’s not feeling well, that’s a form of stress. We have the example, as you quoted, with the schoolteacher. I do see quite a number of schoolteachers with Hashimoto’s in my practice here. During the summer we hardly ever hear from these schoolteachers—they’re on vacation, their stress levels have decreased. When they start school in August or September the stress levels go up and I start seeing more patients during that time with an exacerbation of Hashimoto’s. This is just a perfect example of how stress can affect Hashimoto’s thyroiditis. We have to make medication adjustments according to their stress levels and their symptomology, as well. Adrenal fatigue is a common health problem that is often overlooked or misdiagnosed. In this second of a series on the subject of how this “miracle mineral” can help keep us healthy, Dr. Marcantel talks about using a magnesium supplement to help reduce muscle cramps. Magnesium is the fourth most abundant mineral in the body and affects a host of our chemical processes. Change happens. Should we fight it or go with the flow?